Luke Donald may be celebrating an historic double money list win this weekend, but next year could be a very different story for the Englishman. 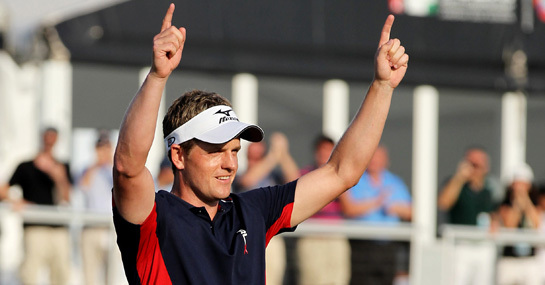 Donald became the first player ever to win the US and European money lists in the same season thanks to his third place finish at the Dubai World Championships. The World No.1 has enjoyed a brilliant season and added the European title to the US title he achieved in back in October when he won the Children’s Miracle Network Hospitals Classic ahead of main rival Webb Simpson. Donald has been installed at 8/1 to win consecutive US money list titles but he should find things a lot harder going in 2012 thanks to the emergence and re-emergence of two of the biggest names in golf. 2011 US Open winner Rory McIlroy is also 8/1 to win the title and, based on his strong finish to the season that could prove a very shrewd punt. However, there is once again one man who everybody expects to dominate golf in 2012 – Tiger Woods. The 14-times major champion and former World No.1 has had a very good couple of weeks and followed up his third place at the Australian Open with a win at the Chevron World Challenge. He is once again at the head of the betting and is currently 3/1 to win the US money list. He has never played a full schedule, preferring to pick and choose his events, and his first event of 2012 is expected to be the Abu Dhabi HSBC Championship at the end of January and – even though it’s a European Tour event – that will be a big test for Woods as he tees up against a full and strong field for the first time in many a month. With coach Sean Foley and caddie Joe LaCava now in place – along with a clean bill of health – things are finally starting look settled for Woods. The rest of the tour had better watch out.